In celebration of Women’s History Month, March Object of the Day posts highlight women designers in the collection. Today’s blog post was written by Maleyne Syracuse and originally published on March 20, 2013. 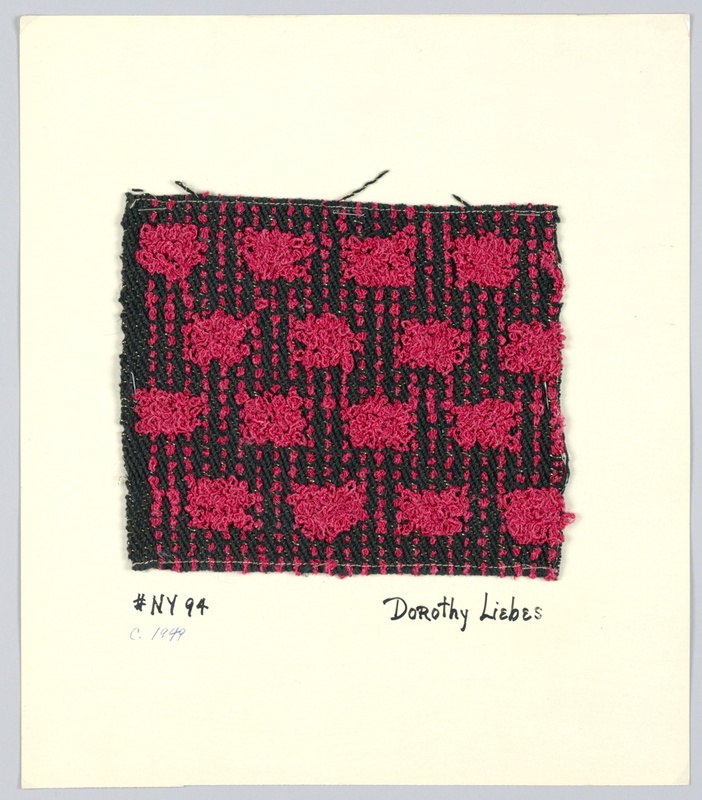 Weaver and textile designer Dorothy Liebes had twin obsessions: texture and color, both exemplified by this sample from the museum’s collection. Liebes’ textiles were known for her innovative use of yarns of different materials and weights to create textured surfaces. She also employed inventive weave structures to create texture, as seen in this sample, where the woven, raised pile squares create a soft, sculptural surface to the fabric. The staggered rows of pile also constitute an integral part of the lively design. The use of looped pile was a staple in Liebes’ design repertoire. She used it a multitude of ways both in her custom handwoven upholstery and curtain fabrics as well as her designs for commercial applications such as bedspreads. Liebes believed “we are born with a love of color, [but] not color taste!” Thus it was up to the designer, “the purveyor and creator of ideas” to find ways to use color successfully. Good design for Liebes was an effective synthesis of color, form, pattern, and texture. The museum’s sample is a superb illustration of what this meant in practice. Maleyne M. Syracuse is a graduate of the Masters program in the History of Decorative Arts at Cooper Hewitt, Smithsonian Design Museum/Parsons The New School for Design, and is President of the Board of Directors of Peters Valley Craft Center. She recently retired as a Managing Director in the Investment Bank at JP Morgan and continues to work part-time as an independent professional in corporate finance and investment management.